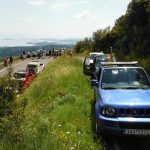 See and discover Corfu by 4 x 4 wheel vehicles. 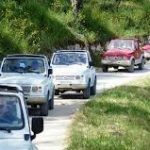 Experience the fun and adventure of the island's beauty, driving through olive groves, beautiful green hills while catching glimpses of the sparkling Ionian Sea. Your 4×4 vehicles will be parked on the pier and from there you will drive along the main coastal road leading to Dassia. 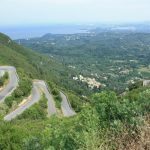 We continue taking a small village road passing by the villages of Kato Korakiana & Ano Korakiana, which are considered the most beautiful of the old, traditional villages on Corfu Island. Leaving the villages behind, you take an uphill narrow winding road to the picturesque village of Sokraki. Here you stop and admire one of the most fantastic panoramic views, a photographer’s paradise. Taking a road for some kilometers, we arrive at the Troumbetta Pass and through the picturesque Kratsalo, Arkadades road and small typical Corfiot Villages; we arrive at the village of Makrades. Here we stop to enjoy refreshments and Greek appetizers. 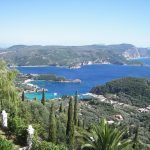 Afterwards we stop at Bella Vista to take pictures of the spectacular Paleokastritsa views before we drive through Lakones Village and taking the main Paleokastritsa –Corfu road southbound, we return to the pier.